What happens when a group of very committed Good Food activists gets together to discuss ways in which philanthropy and personal action can advance the goals of the movement? 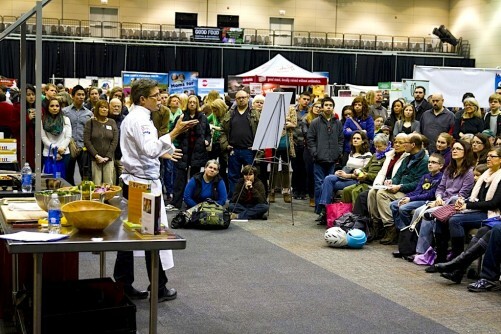 It can get personal… but only in the best way, as participants share how their own life experiences shaped their determination to promote a healthier, more sustainable, more humane, and fairer food system in the United States. This occurred recently at a luncheon organized by FamilyFarmed, the Chicago-based nonprofit that works to expand markets and opportunities for local and sustainable food produced or sold by local farm and food entrepreneurs (and which publishes Good Food on Every Table). 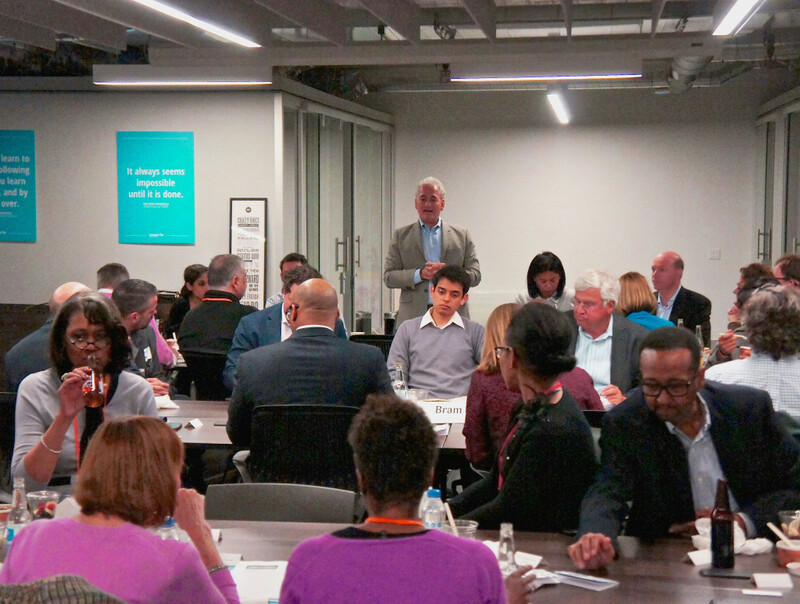 The event was part of the On The Table event, organized by the Chicago Community Trust, which spurred thousands of Chicago-area residents to participate in mealtime conversations aimed at advancing community building. Jim Slama (standing), president of FamilyFarmed, welcomes attendees at its On The Table luncheon conversation about the Good Food movement. 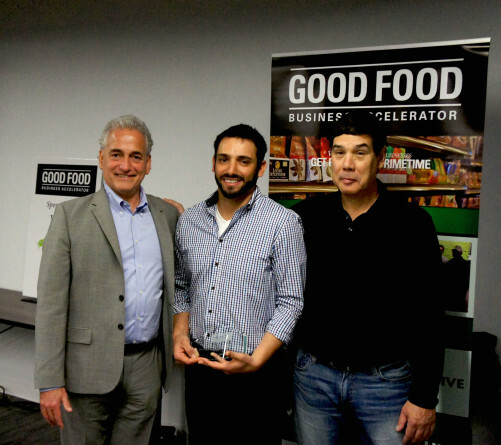 FamilyFarmed’s May 12 event was held at 1871, a rapidly growing center for innovation and business incubation located in Chicago’s famed Merchandise Mart. And it was immediately preceded by the “graduation” ceremony for the first class of nine entrepreneurial businesses that participated in the first class of FamilyFarmed’s Good Food Business Accelerator (see below). 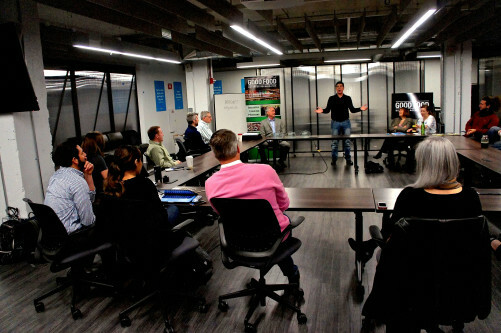 Roughly 50 FamilyFarmed associates and allies were divided among four tables for their lunchtime conversations over sandwiches from Eastman Egg Company, which sources many of its ingredients from sustainable producers in the Chicago region. The conversations around the tables ranged broadly, as some shared nuts and bolts ideas about promoting philanthropy and raising money. But the attendees at the table at which I sat and participated spent most of the hour discussing their personal relationship with Good Food and how providing more and more people with a better way to eat is a gift in itself. One participant (we will eschew names because these remarks were made in private) described how a childhood experience of watching her mother bake cookies with a motherless child from the neighborhood instilled in her the importance of giving back to her community. Another spoke of how her father, owner of a small restaurant, would give a bowl of soup and a sandwich to anyone who came in hungry but couldn’t afford to pay. 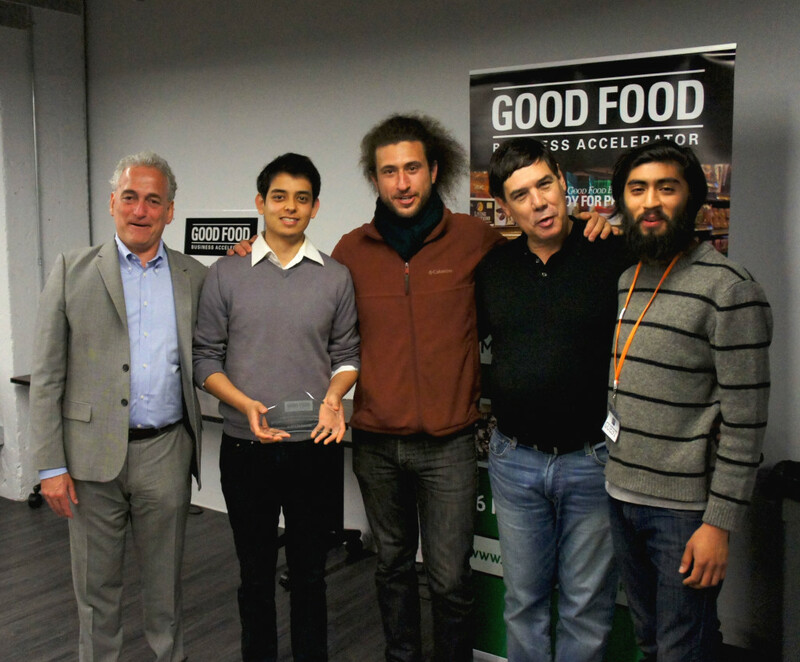 The Good Food Business Accelerator is the latest of FamilyFarmed’s major programs that aim to put the faith and commitment of activists such as these to use in expanding the availability of Good Food and making its benefits more accessible to more people. Michael Bashaw (standing), president of Whole Foods Market’s Midwest region, addresses staff of FamilyFarmed and Fellows in its Good Food Business Accelerator at the “graduation” ceremony for the first class participating in the six-month program. The program, launched in fall 2014, provides an intensive curriculum over six months to competitively selected Fellows — there were nine in the first class that just concluded — along with mentorship, technical assistance, networking opportunities, and interactions with financiers and lenders. Applications for the 2015-16 program, which begins late this year, will be issued this summer (and will be announced on Good Food on Every Table and on the Good Food Business Accelerator website). Below are “class pictures” of the participants in the first class at their graduation ceremony, with links to their business websites below. 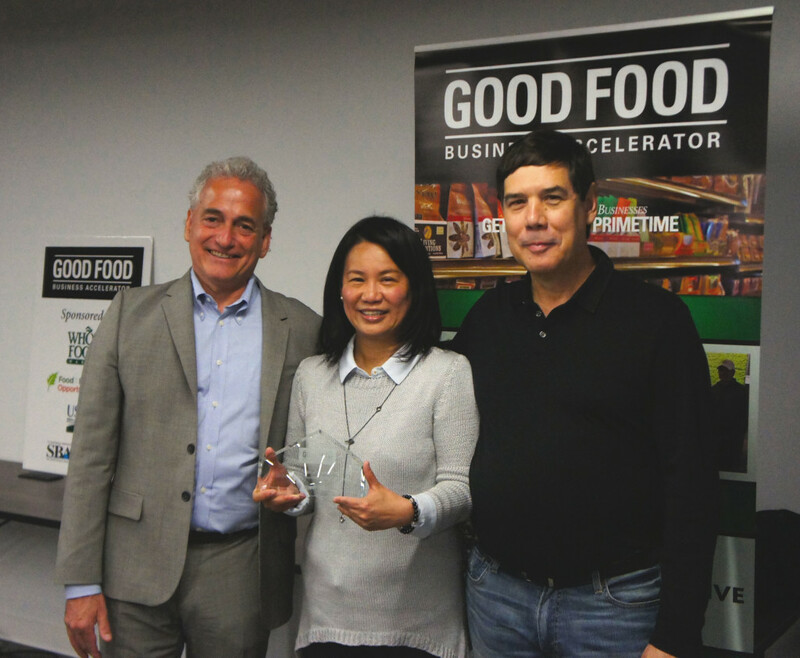 Jenny Yang, whose Phoenix Tofu sells delicious non-GMO soy-based products under the Phoenix Bean label, is flanked by FamilyFarmed President Jim Slama (left) and Whole Foods Market Midwest President Michael Bashaw at the ceremony marking the conclusion of the first Good Food Business Accelerator program. The Urban Canopy, a company that maintains urban farms and a composting operation in Chicago, participated in the first class of the Good Food Business Accelerator. Seen here at the concluding ceremony for the six-month program are (from left) FamilyFarmed President Jim Slama; Alberto Rincón and Alex Poltorak of The Urban Canopy; Whole Foods Market Midwest President Michael Bashaw; and Eric Rodriguez of The Urban Canopy. 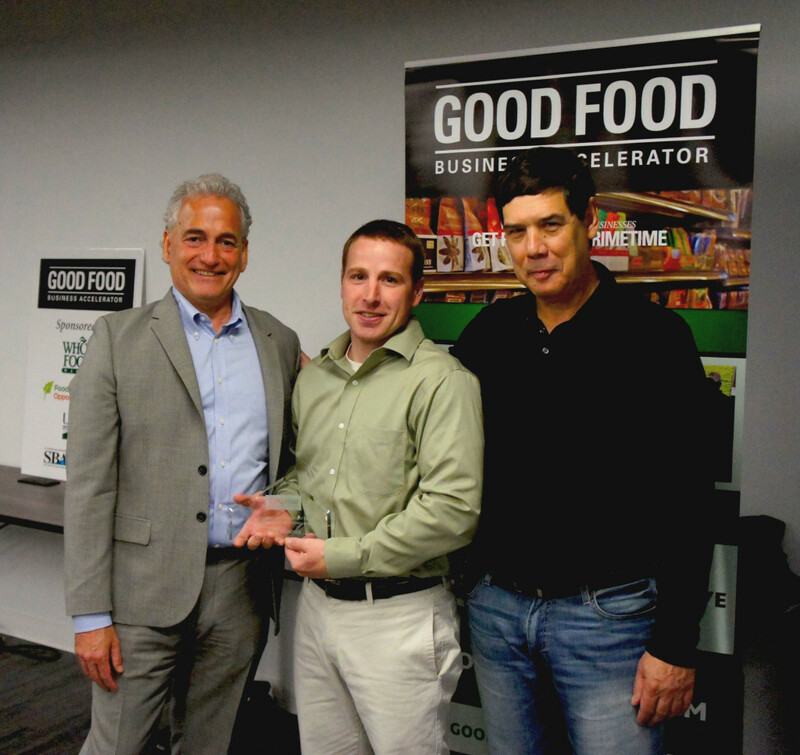 Mark Schneider (center) of Living Water Farms is flanked by FamilyFarmed President Jim Slama (left) and Whole Foods Market Midwest President Michael Bashaw at the ceremony marking the conclusion of the first class in FamilyFarmed’s Good Food Business Accelerator program. Living Water Farms — located in Strawn, Illinois, about 110 miles southwest of Chicago — grows specialty salad greens, microgreens, herbs and edible flowers year-round in a greenhouse and is seeking funding to greatly expand its operations. 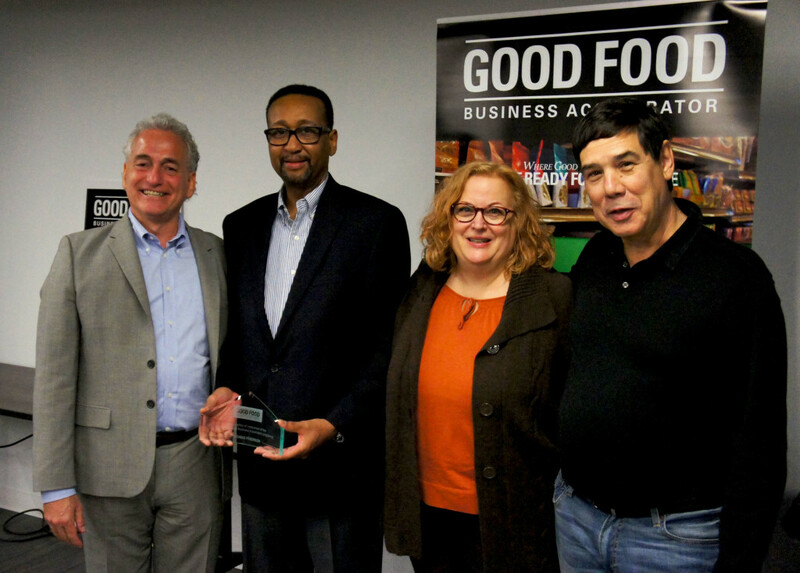 Thomas Frierson and Cynthia Zeki, owners of the Spark of the Heart dry soup and bean salad mix company, celebrate their completion of the first Good Food Business Accelerator program with FamilyFarmed President Jim Slama (left) and Whole Foods Market Midwest President Michael Bashaw (right). 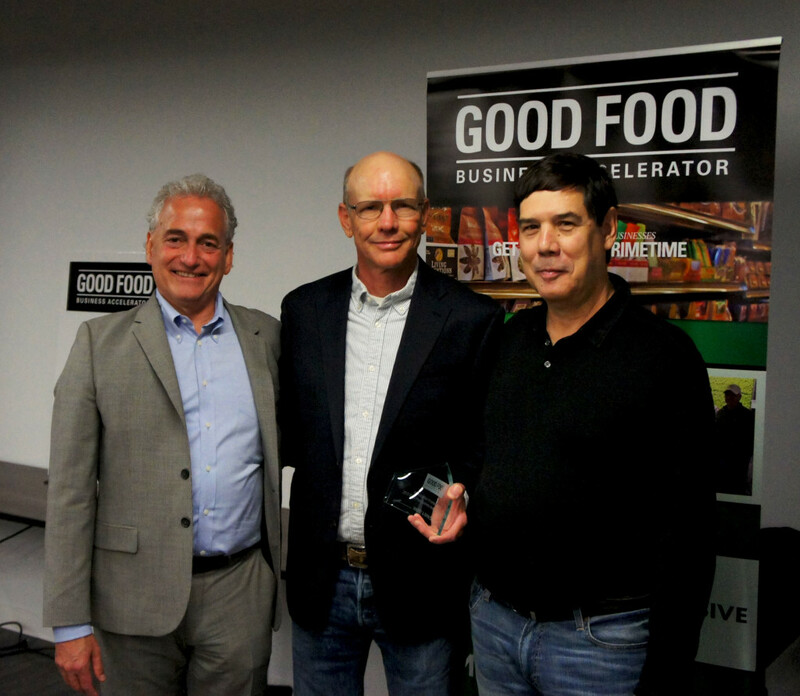 Shane Christensen of dailyServing — which produces a line of healthy functional food and juice combos aimed at people with busy lives — marks his “graduation” from the Good Food Business Accelerator program with FamilyFarmed President Jim Slama (left) and Whole Foods Market Midwest President Michael Bashaw (right). 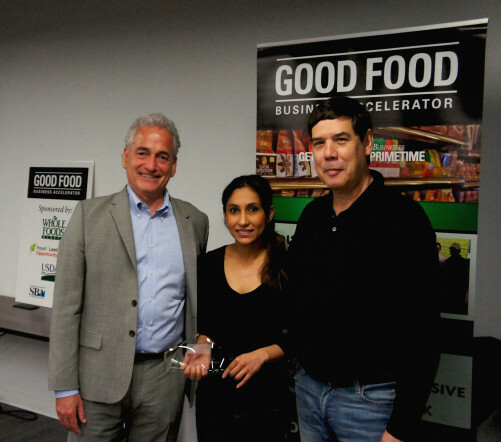 Rowida Assalimy (center), who is producing a traditional Middle Eastern hot beverage called Kishr, marks the conclusion of her Fellowship in FamilyFarmed’s Good Food Business Accelerator with FamilyFarmed President Jim Slama (left) and Michael Bashaw, president of Whole Foods Market’s Midwest region. 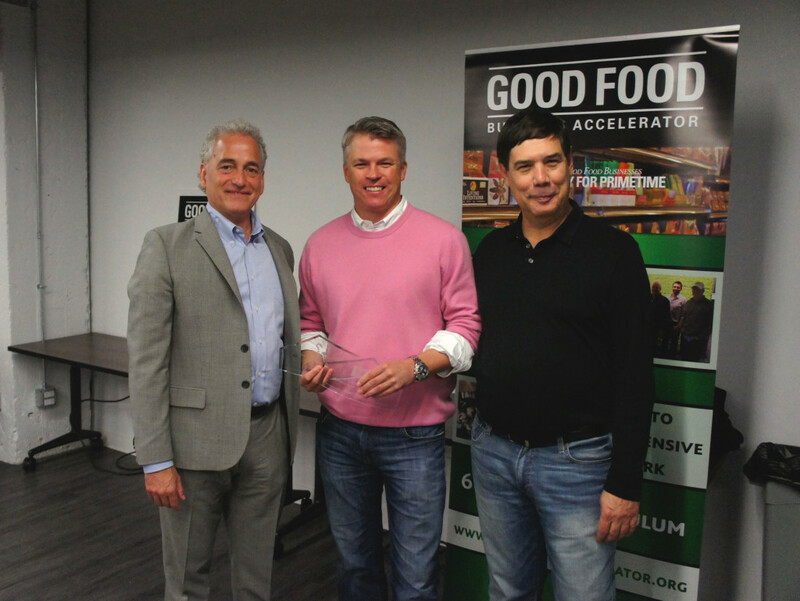 Nik Jakobs (center) of Jakobs Bros. Farms, a livestock and farming operation about 120 miles west of Chicago, poses with FamilyFarmed President Jim Slama (left) and Whole Foods Market Midwest President Michael Bashaw at the ceremony concluding the first class of FamilyFarmed’s Good Food Business Accelerator. Harry Carr, whose Mint Creek Farm (in Cabery, Illinois) produces and sells meat from grass-fed, pasture-raised livestock, celebrates the completion of his Good Food Business Accelerator program with FamilyFarmed President Jim Slama (left) and Whole Foods Market Midwest President Michael Bashaw (right). 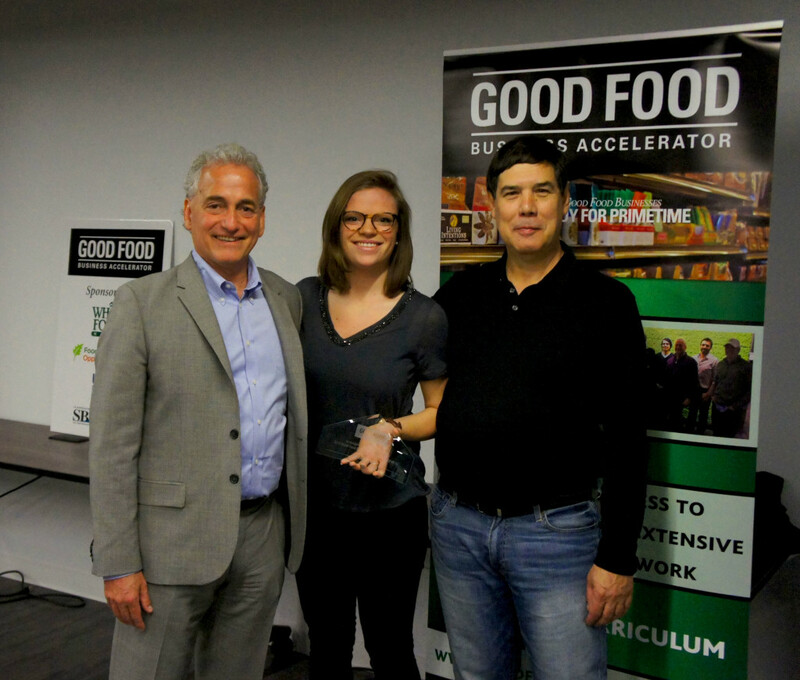 Katy Vogt (center), business development director for FoodTrace, celebrates the conclusion of the first class in FamilyFarmed’s Good Food Business Accelerator program with FamilyFarmed President Jim Slama (left) and Whole Foods Market Midwest President Michael Bashaw. 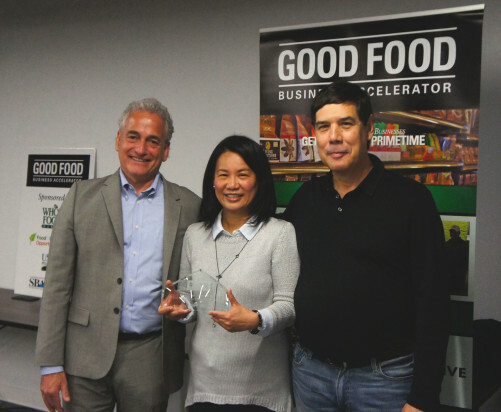 Vogt was representing Accelerator Fellow Riana Lynn, founder of FoodTrace, which has developed an online platform to connect buyers with local food producers. 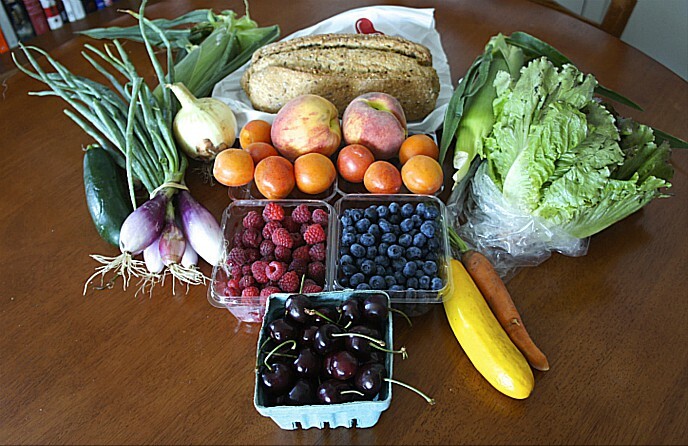 This entry was posted in Farm businesses, Financing, Food Artisans, Food Entrepreneurs, Good Food Business Accelerator, Good Food business development, Good Food marketing, Good Food movement, Small Farmers, Sustainable food business investment and tagged Chicago Community Trust, dailyServing, FamilyFarmed, FoodTrace, Good Food Business Accelerator, Jakobs Bros. Farms, Kishr, Living Water Farms, Mint Creek Farm, On The Table event, Phoenix Bean, Spark of the Heart, The Urban Canopy, Whole Foods Market. Bookmark the permalink.